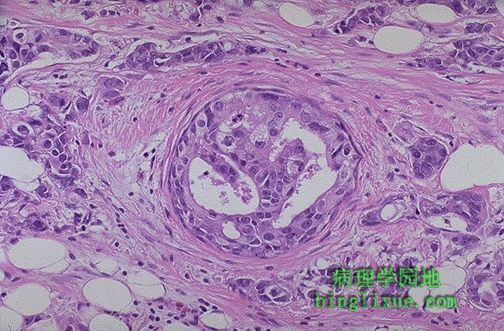 At high magnification, the pleomorphism of the carcinoma cells within the duct in the center (in a cribriform pattern), as well as the neoplastic cells infiltrating through the stroma and fat, can be seen with this infiltrating ductal carcinoma. 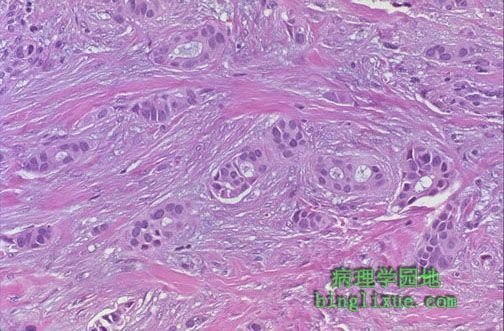 At high magnification, this infiltrating ductal carcinoma of breast is poorly differentiated, with very pleomorphic cells. It would also be important for treatment and prognosis to determine if these cells were estrogen and progesterone receptor positive. This variant of breast cancer is known as colloid, or mucinous, carcinoma. Note the abundant bluish mucin. The carcinoma cells appear to be floating in the mucin. This variant tends to occur in older women and is slower growing, and if it is the predominant histologic pattern present, then the prognosis is better than for non-mucinous, invasive carcinomas. 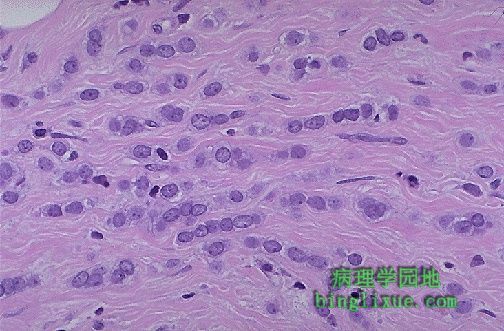 Lobular carcinoma in situ is seen here. 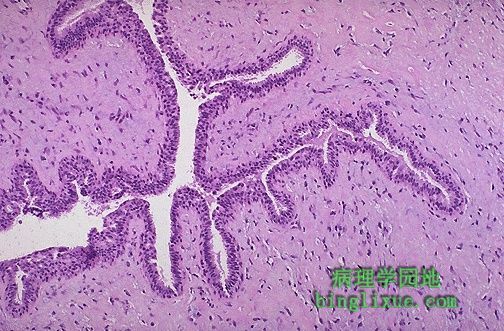 Lobular CIS consists of a neoplastic proliferation of cells in the terminal breast ducts and acini. The cells are small and round. Though these lesions are low grade, there is a 30% risk for development of invasive carcinoma in the same or the opposite breast. Invasive lobular carcinoma of the breast is shown here. This neoplasm arises in the terminal ductules of the breast. About 5 to 10% of breast cancers are of this type. There is about a 20% chance that the opposite breast will also be involved, and many of them arise multicentrically in the same breast. 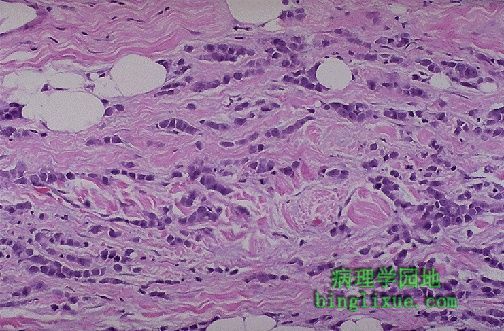 At high magnification, the characteristic "Indian file" strands of infiltrating lobular carcinoma cells are seen in the fibrous stroma. Pleomorphism is not great. A phyllodes tumor of the breast is shown here. They arise from interlobular stroma, but unlike fibroadenomas are not common and are much larger. They are low-grade neoplasms that rarely metastasize. They are more cellular than fibroadenomas. Projections of stroma into the ducts create the leaf-like pattern for which these tumors are named (from the Greek word phyllodes meaning leaf-like). Paget's disease of the breast is shown here. 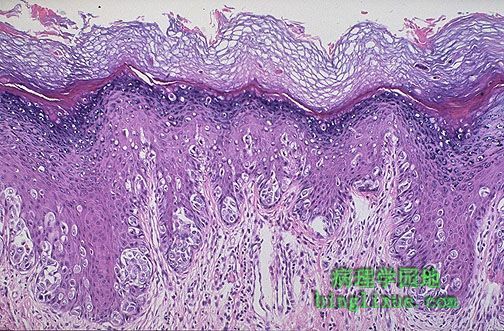 Note the overlying hyperkeratosis of the skin, which helps to produce the rough, red, scaling appearance seen grossly, and there is often ulceration. 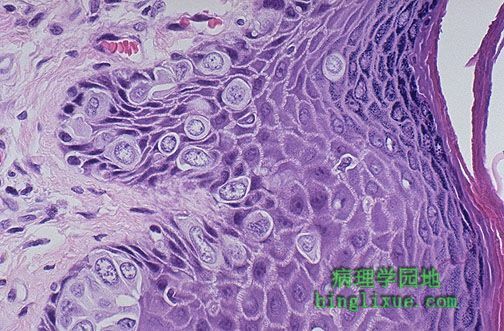 The large cells infiltrating into the epidermis represent intraepithelial extension of an underlying ductal carcinoma in situ or invasive ductal carcinoma. 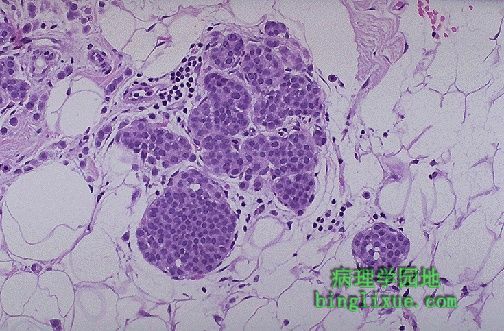 At high magnification, the large Paget's cells of Paget's disease of breast have abundant clear cytoplasm and appear in the epidermis either singly or in clusters. The nuclei of the Paget's cells are atypical and, though not seen here, often have prominent nucleoli. A PAS stain demonstrates mucin within the Paget's cells of Paget's disease of the breast. 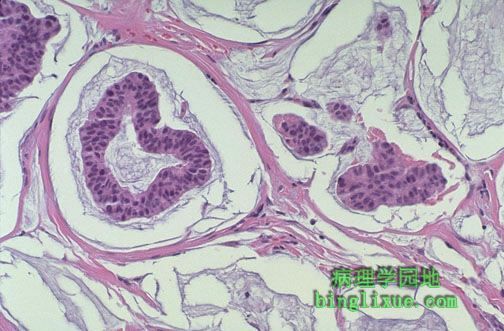 This is evidence for their origin from an underlying ductal carcinoma. 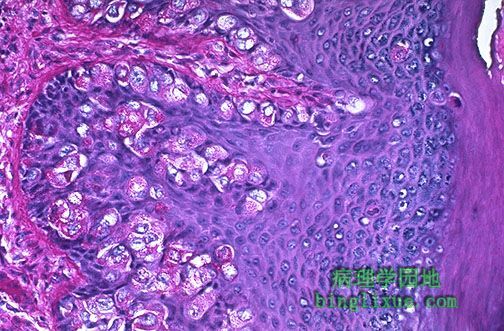 By immunoperoxidase staining, they will also be keratin positive and epithelial membrane antigen positive.